The article 'A Matter of Perspective', published in these pages on Feb 20, accused Tapol, the London-based Indonesia Human Rights Campaign, of lacking credibility and perspective. The survivor of an attack by Indonesian police officers on a group of students in Abepura, West Papua, would view things differently. Mr Peneas Lokbere, a guest of Peace Brigades International, visited Tapol on Feb 21. He described in painful detail how, in December 2000, students were badly beaten and tortured. Two students died in police custody and another was shot dead. None of the students had been involved in criminal activities. Indonesia's National Commission on Human Rights found that the Abepura case constituted a gross violation of human rights. Two senior police officers named by the commission were charged with crimes against humanity. But in September 2005, they were acquitted, prompting widespread dismay in West Papua. No one has yet been held to account for the Abepura abuses. A month before the Abepura verdicts, two British-made armoured vehicles fitted with water cannons were deployed to West Papua to be used by the police for crowd-control purposes. This brings us to the crux of the complaint against Tapol: That in criticising the deployment, Tapol missed the point that military hardware is supposed to be used in conflict areas and to put down 'internal rebellions'. This argument reveals a disturbing lack of concern for human rights, avoids the question of whether military equipment will be used for internal repression, overlooks the highly sensitive political situation in West Papua, and misunderstands the nature of the conflict there. In Tapol's view, there should be a strong presumption, if not prohibition, against supplying military hardware to security forces that are not subject to normal democratic controls. The killing of five security forces personnel in Abepura last year was also a tragedy, but such incidents will not be prevented by providing the security forces with more equipment. A determination to address the Papuans' heartfelt grievances by political means is what is required. The writer is a research and advocacy officer for Tapol. On the same day as Mr Lokbere’s visit to TAPOL, Human Rights Watch published a report on political prisoners in West Papua. It concluded: “While Indonesia is certainly in a transition period, the repression detailed in this report show that there is still much to be done in institutionalising meaningful protections for basic rights in the country”. After much delay, two senior police officers were charged with crimes against humanity. They became the first persons tried in Indonesia’s permanent human rights court. 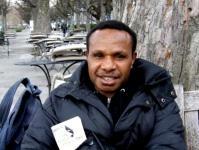 In September 2005, the two men were acquitted, prompting anger and despair among the victims’ families and the wider Papuan community. He appears completely unconcerned about human rights, avoids the question of military equipment will be used for internal repression, overlooks the highly sensitive political situation in West Papua and misunderstands the nature of the conflict there. His disturbingly hard-line position allows him to dismiss the tragedy of East Timor as ‘an unhappy memory’. The writer is research and advocacy officer for TAPOL.